So much more than a food tour! ​Discover the gems of Nice, its cuisine, wine and history with double helpings of food and fun! Nice, the very word sparkles with sunshine and glamour​! Known for its Azure sea and jet set chic, but what about it’s delectable food and wine? We invite you to relish genuine Niçoise flavours and a wide variety of sights in the heritage setting of the old town (Vieux Ville). You’ll see the​ main attractions ​while tasting a generous selection of regional foods and wines! Feel exhilarated by the colours and holiday scent as you stroll through this vast open air museum. Every place we visit has been specially chosen for your pleasure, we even have a sit down meal at a restaurant from 1860. 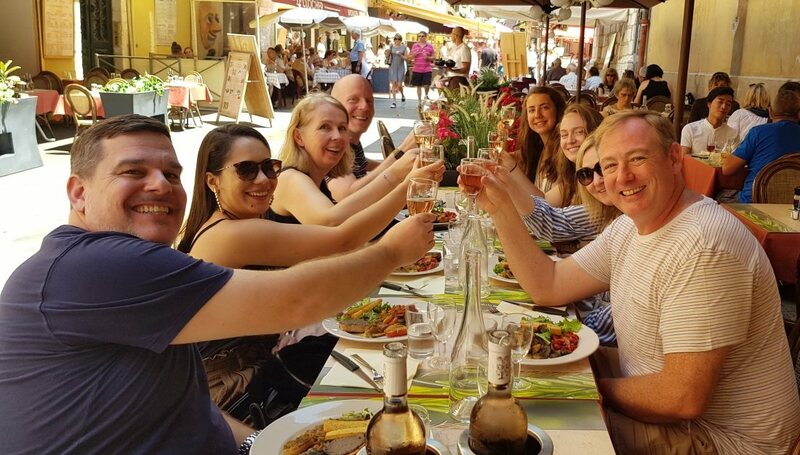 By the end of the tour you'll have seen and tasted the best Nice has to offer. You'll have plenty of great local and AOP Côtes de Provence Wines. Among our tastings we have Fougasse, Limoncello, Petits Farcis Niçois, Gourmet Marinated Olives, Pissaladière, Tarte au Citron Meringuée, three varieties of artisanal Cheese and two types of Charcuterie, Grilled Red Peppers, Socca, Ratatouille, Tourte de Blettes, hand made Chocolate Almonds, Fresh Seasonal Fruits and Gelato! A full refund will be issued for cancellations made 24 hours before the tour date. ​We are happy to accommodate your preferences. Please let us know on the booking form. We visit the ​Antiques market at Cours Saleya in place of the flower market and go to a different chocolatier and confectioner. Recommendations for eats, drinks, must see places and transport details. Private tours available for groups. Please contact us directly for rates and arrangements.